Opera singer, Skye Hunter, returns to the land of her birth as leading lady in Phantom of the Opera. This is her first trip back to bonnie Scotland since her mother whisked her away to Australia after Skye’s father died sixteen years ago. When Skye decides to have dinner at McGuire’s, she’s not going there only for Mary McGuire’s shepherd’s pie. Her first and only love, Callum McGuire, still plays his guitar and sings at the family-owned tavern. Callum has never stopped loving Skye. Desperate to know if she’s changed under her mother’s influence, he keeps his real profession hidden. Would she want him if he was still a singer in a pub? But when Skye’s worst nightmare comes true, Callum reveals his secret to save the woman he loves. Can Skye and Callum rekindle what they lost, or will her mother threaten their future together once again? 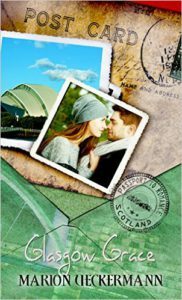 Journey to picturesque Scotland in Marion Ueckermann’s delightful and heartwarming romance novella. I loved the gorgeous white Christmas setting in Glasgow Grace. Skye is an opera singer who returns to her homeland from Australia to start rehearsals in the New Year. She wants to visit her father’s grave in Skye and she’s staying in a swish hotel, courtesy of her opera company employer. Callum knows that Skye is back in town and he has bought tickets for an upcoming performance. Skye visits the pub owned by Callum’s family just before Christmas and she reconnects with Callum. It’s like the old days, when they were teens and head over heels in love. But Callum hasn’t forgotten how Skye moved to Australia with her mother and never replied to his letters. Her mother is a pretentious snob who didn’t think Callum was good enough for her daughter. Callum has his own secrets. He lets Skye believe that he’s a singer and musician who works in the family pub and still drives his old car. The romance at the start of the story seems to plod along almost too smoothly. A big plot twist (that I didn’t see coming) changes everything and challenges their faith. Skye’s career is threatened and Callum’s secret is exposed. They have to work together to overcome all the obstacles in their path to true love. Glasgow Grace has a tender and emotionally satisfying ending that will charm readers who enjoy sweet Christmas reunion romances. To learn more about Inspy Romance author Marion Ueckermann and her books, please visit her website. Many thanks to Marion for providing a complimentary advanced reader copy of the book. Thank you for sharing what seems to be such a heartwarming story. I have this book in my to be read list. Hope you get to read Glasgow Grace soon, Priscila. It releases on 22 July. Thanks for the recommendation, Narelle. You had me with the cover! Pelican Book Group did an amazing job with all the Passport to Romance books. I was really excited when I saw Glasgow Grace’s cover. Hope you enjoy reading the story, Jill, as much as I enjoyed writing it. Aw, thanks Elizabeth and Narelle. Sounds like a good read! Thanks for the recommendation! Hope you get to read Glasgow Grace, Beth. It’s releasing in two weeks’ time. Hope you get to read Glasgow Grace soon, Julianne. I love Scottish heroes. Thanks for the link and pre-order, Valerie. Looks good, Marion! I’ll be getting it. I’ve read this and thoroughly enjoyed it! Glad you enjoyed it, Iola. I love this book!! I think it’s my favorite from this author! I wanted to go hang out with the characters. LOL, Janet. I guess there is just that something about McGuire’s, isn’t there? Sorry so late on this comment, but catching up on reading leaves little time for blogging! Thanks for stopping by, Trixi. Hopefully Glasgow Grace will make it to your TBR pile.